He took graphic design at George Brown College in Toronto. He is best known for co-creating Runaways (Marvel Comics) with writer Brian K. Vaughan. Christina Strain was the colourist for this series and for many other Marvel titles. The series received the Harvey Award. Adrian has worked on other titles including Spiderman Loves Mary Jane and Uncanny X-Force. His art has appeared in magazines Filler and Men’s Fashion. For Sweetness: A Coloured Sketchbook. He teamed up with Christina Strain. He did the drawings she did the colours. The project began when Christina coloured a number of Adrian’s drawings. These sold well at the Toronto Cartoon Arts Festival in May 2011, and as a result they created the book. In 2013 and 2014 he was a contributor to the anthology True Patriot. “Uh-Oh Ogopogo.” Writ., Howard Wong. True Patriot: All New Canadian Comic Book Adventures. Ed., J. Torres. True Patriot Comics, 2013: 67-76. “Mishepishu and the Nutcase.” Writ., Howard & Arwyn Wong. True Patriot: Heroes Of The Great White North. Ed., J. Torres. True Patriot Comics, 2014: 69-76. Front: Col., Christina Strain. Adrian Alphionse & Christina Strain, Oct. 2011. Sweetness: A Coloured Sketchbook. Col., Christina Strain. Adrian Alphionse & Christina Strain, Oct. 2011. “About the Creators.” True Patriot: All New Canadian Comic Book Adventures. Ed., J. Torres. True Patriot Comics, 2013: 103. 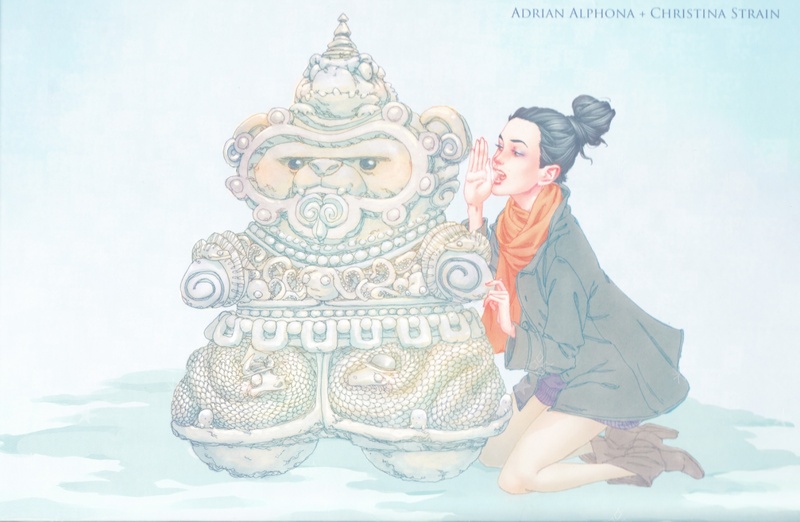 “The Outhouse Interview: Adrian Alphona.” Interviewer, Royal Nonesuch. 29 November 2011. The Outhousers. Accessed 9 March 2018. From Sweetness, October 2011: Front cover.